Joe Fernandez knows social media -- and, by extension -- venture capital. After spending nearly three months with his jaw wired shut -- a result of corrective jaw surgery in 2007 -- Fernandez's primary form of communication was social media. From this pastime, he realized an individual’s social influence should be measurable. So, during the following summer, the former real-estate exec launched Klout, a San Francisco-based service that allows users to track the impact of their opinions, links and recommendations across the social web. More than 2,000 developers now use Klout’s free API. With that kind of, well, clout, the company handily won over investors. To date, the online influence tracker -- which earns revenue from brands like Starbucks and Nike who pay to advertise to key influencers on the site -- has raised a total of $10 million in funding from investors like Kleiner Perkins Caufield & Byer and Greycroft Partners. For entrepreneurs aiming to similarly raise venture capital, here are five early-stage tech VCs who Fernandez recommends following on Twitter. Reid Hoffman is co-founder of LinkedIn and partner in the Silicon Valley venture capital firm Greylock. He tweets juicy nuggets of advice for entrepreneurs and people looking for funding, as well as interesting LinkedIn commentary. Eghosa Omoigui is a Silicon Valley-based tech investor and startup advisor with equity in Miso Media, a music application developer, and the location-based shopping service Retailigence. His Twitter feed is chock full of fundraising news, advice for startups and his personal predictions for the world of venture funding. Sample Tweet: I have Zuck selling 7-10% & raising at least $10b in the $fbook #IPO. we are gonna need a really big boat. what about $GRPN? Co-founder of O'Reilly AlphaTech Ventures, Bryce Roberts -- who splits his time between San Francisco and Salt Lake City -- tweets about venture capital and entrepreneurship. Through his tweets, you'll get a peek into the inner workings of a successful VC operation, as well. Sample Tweet: It's pretty cool when entrepreneurs are willing to take as big a risk on us as we are on them. Klout Score: 60, "Thought Leader"
After selling his company to Salesforce.com, Los Angeles-based Mark Suster joined venture firm GRP Partners where he focuses on early-stage tech companies. He also founded Launchpad LA, a mentorship program designed to help the most promising LA-based companies get funding. He tweets fundraising advice as well as tech and advertising tips for startups. Klout Score: 74, "Thought Leader"
Christine Herron is a San Francisco-based venture capitalist. She’s also a director with Intel Capital and a venture advisor at startup accelerators 500 Startups and SSE Labs. Her Twitter feed offers a steady stream of VC and startup news and advice -- along with musings about her toddler. 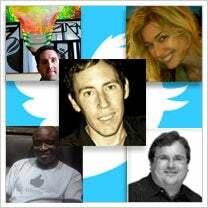 Klout Score: 54, "Thought Leader"
Who do you follow for ideas on how to raise captial? Leave a comment and let us know.